6pp. Features and funcitons of the Scrolling Hundred Board Gadget: A hundred board that scrolls from 0 to 2000. Scrolling arrows and options allow for counting, highlighting multiples and special numbers. 20pp. Activites and ideas for using the Scrolling Hundreds Board. Matching lesson plans, templates and worksheets are available as other resources. 12pp. 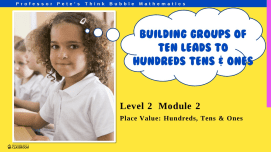 Teacher lead activity and worksheets of varying difficulty, where the number that is one or ten before or after any number. 2pp. Teacher-led activity: Students find and locate the multiples of numbers to 100, multiples patterns, and identifying prime numbers from 1-100. 10pp. Adding using the Scrolling Hundreds Board. Includes activities ranging from simple 2 digit plus 1 digit, through to 3 digit plus 3 digit with regrouping. 9pp. Subtracting using the Scrolling Hundred Board. Includes activities ranging from simple 2 digit take 1 digit, through to 3 digit take 3 digit with regrouping. 7pp. Students are given a number on a card. They have to identify the correct cell from a blank Hundreds Board. 17pp. Bingo game with numbers to 100 that can be used with the Scrolling Hundreds Board. 1p. Students have to guess the number that another student is thinking of. Keep track of which numbers are still available. 7pp. Students are given several numbers on cards. They have to correctly select the multples of certain numbers.